Coca-Cola and Pom Wonderful are gearing up for a court battle, a lawsuit where marketing and the public’s right to know exactly what’s in their food is front and center. At issue is a juice from Coca-Cola’s Minute Maid division, and Pom Wonderful’s allegations that the juice’s label is completely misleading. In fact, it is very misleading. If a juice is labeled as a Pomegranate Blueberry juice blend and has a photo of pomegranate fruit and blueberries figuring prominently in front of apples, grapes, and raspberries, one would gather that the juice likely has as much if not more pomegranate and blueberry juice as it does other fruit juices in the blend. One would think. But as we know, food producers are quite crafty with their marketing and labeling, and they really aren’t concerned with how deceptive practices can mislead conscientious consumers. 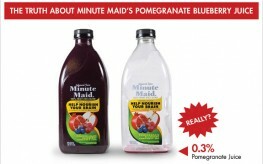 The label on Minute Maid’s Pomegranate Blueberry Flavored Blend of five juices is misleading. Pomegranates and blueberries are the only fruits mentioned in the title. Their photos are prominent on the label. But the juice is 99.4 percent apple and grape-derived, containing only 0.3 percent pomegranate and 0.2 percent blueberry juice. Pom Wonderful first sued Coca-Cola under the Lanham Act in 2008, an act that only allows companies to take action against other companies. For Pom Wonderful, the fight is personal since their pomegranate juice is 100 percent pomegranate. Consumers purchasing the Minute Maid blend are likely to think they are getting a juice with a fair amount of pomegranate. But only if they are careful enough to read the back label will they realize pomegranate is far from the first ingredient. Side note: If you aren’t reading the labels on the back of your foods, you are doing your health a disservice. So far, the Food and Drug Administration has allowed labeling practices like that on the Minute Maid juice, letting food companies name beverages according to the flavor rather than the actual content. The nation’s High Court will now decide if Pom has a right to sue Coca-Cola under the Lanham Act and how federal laws affect the battle. Bloomberg Businessweek says that if the Supreme Court sides with Pom on the issues, it could mean increasing legal scrutiny for the makers of processed foods and their deceptive labeling practices—something we should all be hoping for. Typical Coca-Cola tactic. They’ve been poisoning the planet for years, why stop the lies now? In Mexico, they control the water treatment plants and charge less for Coke than for bottled water… which is one of the reasons Mexico now surpasses the US in obesity rates. In Iraq they were caught bottling river water and selling it during the war. I think this is a big DUH for readers of Natural News. Can you get the info out to the general public? What really should concern people is that they to grow their own fruit, or buy it locally and make their own juice, because these LIARS are destroying the entire planet with greed, fukishima, another Ukraine power plant now melting down, perpetual wars pollutions, industrial waste, turning china into a toxic wasteland to fund world empire building etc. The world is currently run by a majority of the hierarchy that’s selfishly and criminally insane. Share these sites in every creative way you can. Good post. I often wonder how they can get away with such lies. Simply places an X label on something does not make it Y. But they know most people do not read the labels.